Gold damask faille-moir� fabric with gold satin lining. 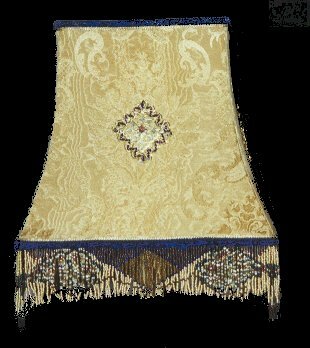 The trim is an antique royal blue velvet cording, and the gold metallic trim bordering the blue velvet is also a vintage trim. The accent is a florentine gold metallic piece, bordered with gold and amythyst trim, accented with an amythyst stone. The original-designed seed beaded fringe is 2", also accented with genuine amethyst beads.